You continually amaze me with your creations Lyn! This little piggy is uber-cute, and tiny piggy is uber-uber-cute! Sorry your kiddos are driving you nutzo. Hang in there, school will start before you know it. Tiny piggy is fab. I know what you mean re: children. We are currently try to wean Harv off his night-time bottle before bed. His response is ARRRRRRGGGGGGGHHHHHHHHHHH!!!!!!!!!!!!!!!! Wine. Yes please. 6:20 should be glass #2, don't you think? aahhh he's just delicious!! He looks like he's practising dancing with his arms in that position, really really lovely. Completely adorable. Tiny's ears are just too sweet. 6:20 for wine??? Hey, if it's after noon, I say go for it! Love the piggy! You are killing me with cuteness! The elephant, the baby monkey, and now the pig. Yikes! I want them all. #1--They thought it up when kids helped out in the fields. Hello? Industrial Revolution? This piggy is absolutely awesome. What material is it made out of? Terrific job!! 6:20 is not too early if you've been good and have not had any wine after lunch. If you have had some post-lunch wine, I'd say give it until 6:30, just to be safe. Oh, and put away the sharp instruments before pouring! 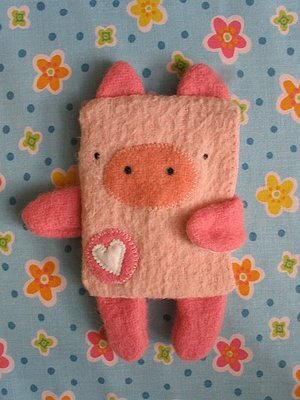 I love the pig and it's tiny piggy friend! So cute. what a gorgeous piggy and tiny piggy, and definitely never too early!!! I would say 5.30 is a good time for a glass, however if you mean 6.30 in the morning - girl you got problems! And working in school myself, you DO need seven weeks REALLY!! Yes, where do you get that fabric? Love the piggy and hey, anytime is the right time for a bit of wine! This Little Piggy is Adorable and if I was a Wolf...I'd pignap him! if you have kids, you have to have wine - even at 6:20! i love your animal pouches and your blog! good stuff! Bring the wine over here and we'll share it, make sure you bring at least 2 bottles though. Or maybe we should meet somewhere totally different and not tell the families where we're headed?! Love piggy, she has the sweetest little face. A relative of mine always says it's ok to have a drink 'once the sun is over the yardpost'. Although I have no idea what this means exactly, I suspect it means that anytime after midday (eek!) is fair game - so you're safely in the drinking zone!! Cheers! Piggy! And Tiny Piggy!! Simply awesome! Is Tiny Piggy crocheted? I love it and tiny piggy is gorgeous. Good Luck with the holidays too! Nice stuff!Love the pig! I've seen your comment to my collage in our blog and decided to visit yours. Love your little purses! So cute... make 'em and sell 'em, please! I firmly believe that as soon as the clock strikes 6 p.m. it is time to pour a glass of wine (or make a gin and soda). Hi. Just found your site. You have some lovely and very cute purses. Really love them lots! BTW, 6.30pm is not too early. I have had to resort to a glass at 1pm. But usually its around 7pm. i think a glass of vino at lunch is lovely. i knew a lady when her girls were growing up she would get together with the neighbor lady, who also had kids & they would drink wine while the kids played. she said it was a huge help. it really took the edge off. i love you little carries so, so much. 6:20 pm is definitely not too early... I might even endorse 6:20 am on the right day... I hear ya! You're killing me with these little bags - the recipient of the little piggy is sooooo lucky! 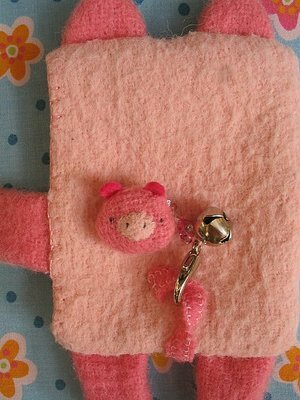 And where overseas might you be going with cute little piggy? I love the wee piggy, you are very creative. WHEN ARE YOU SELIN THEM I HAVE TO HAVE 1 THERE SO CUTE I WANT ONE NOW!=D PS GIVE ME A GOOD DEAL!! !